The William Field Memorial Hart-Montague Trail is a paved, 22-mile long trail through a forested area. Originally part of the Chicago and West Michigan Railroad, the rail corridor was purchased by the late William Field in 1982, donated to the Michigan Department of Natural Resources and converted into an 11-mile long recreational trail. In 2014, the name of the trail was updated to honor Mr. Field and in the summer and fall of 2015, after years of fundraising and planning, the trail was completely rebuilt. During the improvement project, the trail was widened to 10 feet, resurfaced with asphalt, and three new bridges were installed to span Carlton Creek, a tributary of White River, where the trail crosses over the water. In 2011, a fisheries study recommended that the original culverts be replaced because they were hindering fish passage. As the best solution, the following three structures were selected as the best replacement options. In the first location, a 52' x 14' Connector®-style Continental® truss structure replaced twin 96" CSP pipes. Secondly, 36 ft of 15'-4" x 10' Aluminum Structural Plate with aluminum headwalls and wingwalls replaced a 48" diameter culvert. The new structure was three times the size of the original culvert. 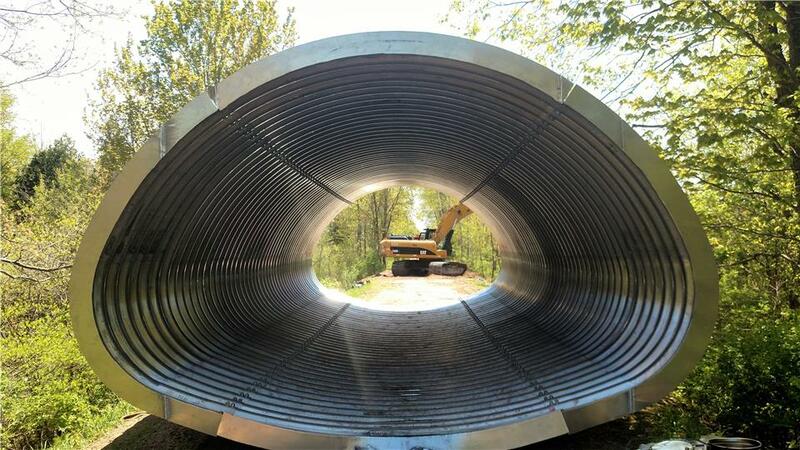 Lastly, 45 ft of 142" x 91" Corrugated Aluminized Type II Steel Pipe Arch was installed with the new structure four times the size of the former 30" diameter culvert. All three of the new structures are wide enough to accommodate the stream's flow while also restoring the ability for fish to swim upstream. "Oceana County has spent many years rebuilding the Carlton Creek system to allow for fish passage," stated Lisa Dutcher, Carlton Creek Program Manager. "Replacing the twin culverts with a clear span pedestrian bridge was the centerpiece of the entire program. Contech and its teams have been instrumental in this project by offering different options and cost effective solutions."